BIG SALE!! RUNE SETS BIG SALE!! Elder Futhark glyphs with 24 marked runes and 1 blank piece. A beautiful set of Mixed Gem Rune Stones which include Amethyst, Hematite, Red and Blue Goldstone, Rainbow Fluorite, Rose and Clear Quartz, Tiger Eye and more. The Rune symbols are engraved in goldtone on these smooth multi gem tumbled stones and combine the ancient system with the power of the crystals. Iridescent Opalite gemstone Rune Set shimmers with rainbow colors like Opal. Opalite is a man made stone made from natural Calcite and can be used as Feng Shui tools to clear negative energy and increase the positive Chi energy in dark rooms and corners. 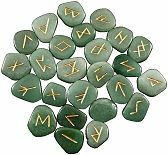 Hand made Green Aventurine Rune Stones originally from Brazil. Aventurine fosters integration of the emotions, enhancing creativity, clarity and augmenting the pioneering spirit. The rune symbols are engraved in goldtone on smooth tumbled Aventurine stones and combine the ancient system with the power of the crystals. Hand made Amethyst Rune Stones originally from Brazil. Amethyst is a stone of spirituality and contentment. It magnifies the energies of Love, Forgiveness and Healing. 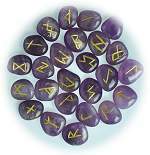 The rune symbols are engraved in goldtone on Amethyst smooth tumbled stones and combine the ancient system with the power of the crystals. The Viking Runic alphabet was used both in daily life and by Rune Masters for divination. The Viking Runic alphabet was used both in daily life and by Rune Masters for divination. The symbols are engraved on Black Obsidian smooth tumbled stones and combine the ancient system with the power of the crystals. Beautiful Black Obsidian from the volcanic bowels of Mother Earth has been used from ancient times in Shamanic prophecy and healing rites. 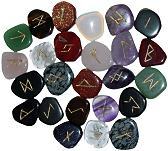 Hand made Bloodstone Rune Stones from India. Bloodstone from India, also known as Heliotrope, is a powerful healing stone with wonderful grounding and balancing properties. 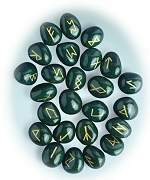 The rune symbols are engraved in gold tone on Bloodstone polished rounded stones and combine the ancient system with the power of the crystals. The Viking Runic alphabet was used both in daily life and by Rune Masters for divination. 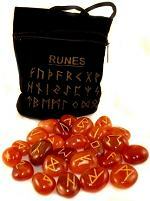 Hand carved and polished Carnelian Rune Stones from India have deep red tones coupled with a silky grey backdrop. Carnelian is believed to protect against envy, fear and rage and helps to banish sorrow from the emotions. Large real Crystal Quartz Rune Stones in Emerald satin bag. For eons Quartz has been a revered healing crystal carved as amulets and talisman often buried with loved ones for safe passage to the afterlife. This set is carved in the Viking Runic alphabet which was used in daily life and also for magic and divination. 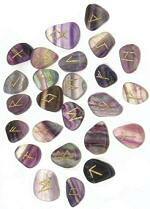 Chinese Fluorite Rune Stones with good clarity and delicate shades of purple, green and clear quartz. Fluorite is reputed to have a purifying and revitalizing effect. The symbols are engraved on Rainbow Fluorite smooth tumbled stones and combine the ancient system with the power of the crystals. Every ancient culture developed a form of divination or interpretation of the "times". The symbols are engraved on red Goldstone smooth tumbled stones and combine the ancient system with the power of the crystals. These beautiful deep red stones dazzle the eye, as the light bounces off the thousands of golden sparkles hidden within. Every ancient culture developed a form of divination or interpretation of the "times". The symbols are engraved on blue Goldstone smooth tumbled stones and combine the ancient system with the power of the crystals. These beautiful deep blue stones dazzle the eye, as the light bounces off the thousands of golden sparkles hidden within. 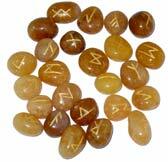 Large, beautifully polished large Gold Quartz Rune Stones from India. Gold Quartz has been called the "Golden Healer" by Melody and other Crystal Masters. The Rune symbols are engraved in gold on polished rounded Golden Quartz stones and combine the ancient system with the power of the crystals. 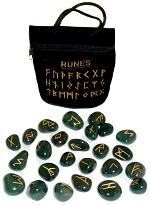 25 Large Runes, Large Velour Pouch & Pocket Legend Card included. 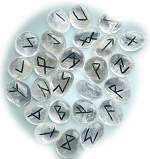 The Viking Runic alphabet was used both in daily life and by Rune Masters for divination. The symbols are engraved on Hematite smooth tumbled stones and combine the ancient system with the power of the crystals. Hematite has been considered a "Stone of the Mind", enhancing mental attunement and original thinking. 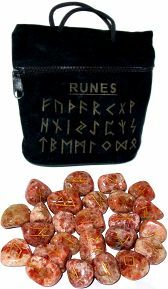 Hand carved and polished Red Jasper Rune Stones originally from Brazil have shiny, brick red hues. Red Jasper is said to be a stone of justice and protection, assisting to rectify unjust circumstances. 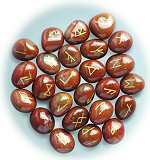 The Rune symbols are engraved in gold on smooth Red Jasper tumbled stones and combine the ancient system with the power of the crystals. Hand made gemstone Rune Set in dramatic Kambaba Jasper from Madagascar. Kambaba Jasper aka crocodile jasper, is a black stone with beautiful random turquoise green markings. All Jaspers are mystical stones and Kambaba Jasper is said to soothe anxiety by focusing the mind on cleansing and detoxifying one's self and environment. Hand carved and polished Rose Quartz Rune Stones originally from Brazil have shiny, translucent pink hues. Rose Quartz is the traditional lover's stone and an excellent Feng Shui accessory for good fortune and prosperity. The Rune symbols are engraved in gold on Rose Quartz smooth tumbled stones and combine the ancient system with the power of the crystals. The Viking Runic alphabet was used both in daily life and by Rune Masters for divination. The symbols are engraved on Snowflake Obsidian smooth tumbled stones and combine the ancient system with the power of the crystals. Obsidian takes on Snowflakes when a white mineral Phenocryst is present. It is a stone of purity, bringing balance to body, mind and soul. 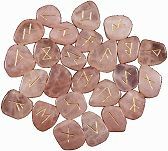 Rare hand carved and polished Large Sunstone Rune Stones from India have chatoyant orange and cream tones with etched gold Rune symbols. Sunstone is known for it's iridescence and brilliant reflections. Sunstone is used to increase vitality and reduce stress. It can bring good luck in games of chance. The Ancient Greeks believed Sunstone represented the sun god and brought life and prosperity to it's possessor. 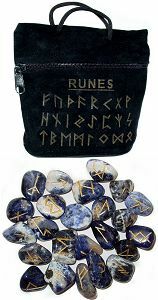 25 Runes, Deluxe Etched Pouch, Large Picture Reference, Pocket Legend Card & Storage Bag included. Every ancient culture developed a form of divination or interpretation of the "times". The symbols are engraved on Tiger Eye smooth tumbled stones and combine the ancient system with the power of the crystals. Polished Tiger Eye is a joy to look at with it's rich chatoyancy and deep reflective colors. Tiger Eye exudes assertiveness and drive. 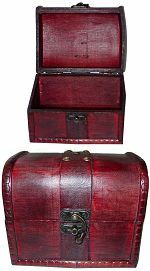 Large cherry finish wood Pirate Treasure Chest box is a replica of old time leather strapped wood trunks. It is available in two sizes to store your rock and gem collectables and other precious keepsakes. The decorative wood trim and antique brass accents and front latch make this an appealing home decor accent piece. Hand carved and polished Large Blue Sodalite Rune Stones from Brazil have complex deep blue Sodalite and white Calcite markings similar to Lapis. Sodalite encourages fellowship and unifies individuals towards a common purpose. The symbols are engraved in gold on Sodalite smooth tumbled stones and combine the ancient system with the power of the crystals.